Pelham (4-2) scored first in the game when Greg Blue kicked a 21-yard field goal and the Panthers led 3-0 with 7:23 left in the first quarter. Kasey Clark had a big reception on an over the shoulder catch to setup the Panthers field goal. With 4:24 left in the first quarter, Peterson scored on a 21-yard touchdown run and Pelham led 10-0 late in the first quarter. With 9:18 left in the second quarter, Peterson scored on a 3-yard touchdown run and the Panthers took a 17-0 lead. With 6:47 left in the half, Xavier Lankford scored on a 3-yard touchdown run and Pelham led 24-0 and they still were not done in the quarter. With 1:14 left in the half, Peterson scored on a 34-yard touchdown run and Pelham took a 31-0 lead at the half. "I thought we had a good plan coming into the game," said Eagles head coach Chris Bell. "We just can't show up to a game and think we will just get the win. Hats off to Coach Causey and Pelham for a great game tonight." Oak Mountain (1-4) scored first in the second half when Luke Percer scored on an 8-yard touchdown run. With the Eagles score, Pelham still led 31-7 with 11:43 left in the third quarter. The Eagles turned the momentum scoring right after halftime, but Brandon Sledge broke off a 90-yard kickoff return for a touchdown and Pelham led 38-7 with 11:30 left in the third quarter. Oak Mountain came right back and Evan Smith pass to Noah Young over the middle of the field resulted in a 25-yard Eagles touchdown. With the score, Pelham still led 38-14 with 10:04 left in the third quarter. With :10 seconds left in the third quarter, Peterson scored on a 10-yard touchdown run while getting his fourth touchdown of the night and the Panthers led 45-14. "We stuck with the coaches plan while executing the plan and we did a great job of playing together as a team tonight," said Panthers RB Peterson. "It started off slow to start the season with me, but I'm gaining a lot more confidence in myself and our offensive line and they did a great job opening up holes for me to run through. This gives us confidence as a team going forward and we just need to keep it going in the second half of our schedule." With 8:00 left in the fourth quarter, Xavier Lankford broke off a 20-yard touchdown run up the middle and the Panthers broke open the game by a score of 52-14. The Eagles had a late touchdown with 3:18 to go in the game as Eli Hackbarth scored on a 1-yard touchdown run for the final score of 52-21. 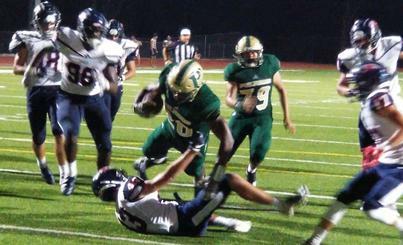 The Pelham defense played an awesome game holding Oak Mountain to only 14 points with their starters in the game. The Eagles scored more against Hoover, Hewitt-Trussville and Thompson this season. "The key for us was practicing the option all week," said Panthers linebacker Ryan Jewell. "We run the same offense so we see it a lot and I think it was an advantage for us. We knew we had to stop the run and we did that. Everyone has to do their job when you run the option. Hopefully this win gives us some respect and feels really good. I think our offense and defense was on the same page and it was good to see." For Pelham, Lankford had 73 yards on 11 carries with two touchdowns. Jalen Cook had 67 yards on 6 carries. For the defense, Jewell had 12 tackles and Brock Higdon had five tackles for the winning team. For Oak Mountain, quarterback Evan Smith completed on 8-of-13 passing for 78 yards and a touchdown, and also added 70 yards on the ground on 19 carries. Luke Percer had 131 yards on seven carries in the game. Next week both teams go back to region play, Oak Mountain will host Mountain Brook on Thursday while Pelham will travel to Carver-Birmingham for a Saturday night game.